This is the first official release U.F. Grant made in 1928. 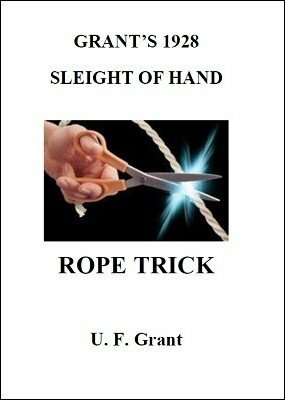 This came before his 45 Tricks , and was an amazing rope trick well before its time that introduced the magic world to the genius of Grant. Very rare and seldom seen. EFFECT: A length of rope is displayed measuring about 3 feet long. This can be passed for examination before and after the trick. The rope is taken and the ends tied together. The performer states the rope can be cut and restored in any section of the loop. He proceeds to cut the rope 3 or 4 inches from the knot and then restoring it there. It is again cut; this time in the center and again it is restored. Now 3 or 4 inches are cut from both ends of the rope; these ends and the remaining part of the rope are passed for examination. 1st edition 1928; 10 pages.